Jason, I never said that Chinese chess is derived from shatranj. I suggest that both are derived from Shatranj al-Kamil, V.1 (John Gollon's listing), which was played on a 10x10 board. My reasoning is at http://www.goddesschess.com/chessays/johnayer.html . I think the names 'India' and 'China' are having an undue effect, making people think of the modern nation-states, which are rivals. Gerhard Josten, of the Initiative Group Koenigstein, postulates that proto-chess was invented in the Kushan Empire, fusing elements of Greek origin (from the game of poleis or petteia) brought by the Macedonian army with elements of Indian origin (taken from a race game) and elements of Chinese origin (from liubo). His essay is at http://www.mynetcologne.de/~nc-jostenge/ in a pdf. I would like to hear what you think of it. Myron J. Samsin, also of the IGK, argues for a somewhat earlier date in the same area http://www.schachquellen.de/15122.html . I would also like to hear why you think that the Spring and Autumn Period and the Warring States Period are a particularly likely setting for the origin of chess. To Charles G.: When I say 'finished in development', what I mean is that the fact that 8x8 Chess could be improved at least 500 years after Xiangqi's last improvement before it was 'finished', suggests that the original 8x8 game comes after the original Xiangqi game. It's not full proof, but generally if 2 games come from the same source, it should be faster for the original game to finish its development first because there should be less changes necessary. And my point is that there were less changes needed to be made from pre-cannon Xiangqi to cannon Xiangqi as opposed to 8x8 Chess with 1 space moving counselor and 2 space moving minister and 1 space moving pawns and no castling and obviously no en passant. Chess' complexity is approximately the same as Xiangqi (state-space) and Xiangqi would have been more complex than Chess before the bishop and queen were made long range and the pawns 2 spaces. In Xiangqi, pawns only move 1 space, the 2 counselors only move 1 space in the palace, and the minister still moves 2 spaces exactly. That means all they did was add an additional minister, counselor and the 2 cannons in the only place they can fit on the board. That's an easier development process than what happened with 8x8 Chess in Europe. So if both games have those same moving pieces and they come from the same game, then Xiangqi is more likely the first game because those pieces still move the same on the board. I'm not making a strong argument about which board comes from which. Just that the in terms of game development, a game that does not need to change the movements of its pieces is probably precedes another game with the same pieces on a different board and different setup. In order to say logically that the original moving pieces are borrowed from 8x8 Indian Chess in its first known form, the Chinese would have had to take the one space moving counselor and 2 space moving minister and change the board dimensions to make those pieces work properly. That is not impossible, but it is less likely. Generally, a civilization would change the movements of pieces and rules of the game when developing a game and not the board. When I say 'finished its development' I know it is a matter of opinion what 'finished' means, but I am saying that the fact that the minister and counselor needed improvements for 8x8 Chess to be as good as Xiangqi with the cannons, suggests that the game came later and the movement of the pieces are borrowed. Logically speaking, if 8x8 Chess came first, the Indian/Persian civilizations would have put in the long range bishop/minister to begin with and not made a 1 space moving counselor which does not make much sense next to the king. If the king can move to all of its 8 spaces around it, why would you want to put a piece right next to it that can move 1 space diagonal only? It seems out of place and not logical. And the minister or bishop moving exactly 2 squares seems silly also because that piece can only reach 25% of the squares on the board. If Xiangqi came from 8x8 Persian/Indian Chess, then there would probably be changes to the movements of the pieces and not the other way around to fit the different 9x10 intersection board. Instead, we have the same moving pieces on both games and they need to be changed on 8x8 and not 9x10. The 1 space moving counselor in Xiangqi makes sense because the general or emperor moves only 1 space orthogonal and therefore the counselor(s) moves differently than it. The 2 compliment each other. In 8x8 Chess, the 2 pieces in the center do not compliment each other. I am not pointing fingers at anyone on this board, but the general attitude of most Western sources that say with authority that Chess comes from India at a certain time without doing any research into how related chess games were developed in other parts of Asia. That seems like the European world wants their version of Chess to be the first one. The original one and arguably the best. I often read in places, that Shogi and Xiangqi are not as good and appealing as Chess. It looks like bigotry to me or at least ethnocentric thinking which all cultures are like to a certain degree. However, I have noticed that Asian cultures like Japan and China don't automatically say that FIDE Chess is junk and should be disregarded because its just copied from Xiangqi or Shogi. That kind of attitude is not as prevalent although the Japanese and Chinese also have their own superiority issues. You guys say that no one on this board has any stake in whether the game comes from Persia, Afghan, India, China or any other place, but I think there is something at stake. Maybe not necessarily with everyone on the board here, but with the Western world in general. Since the Western world plays the best and most commonly accepted form of Chess on an 8x8 board with Staunton pieces, if it were to be said that the birthplace of Chess comes from China and not India, it would in a way damage the image of the game as being the original and best one. The concept being sold is that India is the birthplace and Europe improved the game to what it is today. If people start saying the Indian version is borrowed from the Chinese version on a different board, then Chess loses its mystique and 'credibility' almost. If you love 8x8 Chess or any form of chess, you naturally do not want to say it is just copied from another game because it hurts your pride as a person who plays that game as well as to perhaps your culture too. I talk to Westerners, Chinese, Korean, and Japanese people and none of them want to say that their game was from another game. They all like saying their game is original to their culture and they came up with it on their own. Since we know for sure 8x8 Chess doesn't come from Europe, it has to be linked to some where and India/Persia are the earliest known places the game comes from which is fine. What is not fine is to say that other related games are assumed to be copied from the first known cases of 8x8 Chess. That's an assumption that should not automatically be made because as in the case of the Chinese civilization, the Western world is telling the Chinese world that they cannot make certain conclusions or estimations based on their own history without proper evidence. I'm saying that its wrong for people to demand evidence from a civilization that they have proof that their own game comes from their region. If they want to say it comes from their region, that's their business. You don't have to agree with it, but it seems that for Chinese Xiangqi historians, they are automatically wrong to think Spring and Autumn period or Warring States period without sufficient evidence. Charles has said several things that I had in mind when I was obliged to break off. I want to add that I think the concept of 'a game that has finished its development' is unsound. Shatranj/medieval chess was played for at least eight hundred years, and during that time most people probably considered it a finished game. A few restless minds kept tinkering with it, usually to no effect. Lastly, Jason, you should stop claiming racial grievance and imputing improper motives to everyone else. We mongrels of the western world have explained repeatedly that we have nothing to gain or lose by whether chess originated in India, China, Egypt, or Antarctica. Nor is it true that we have announced a doctrine and then refused to reconsider. We have made an interpretation of the (alas! imperfect) evidence, but eagerly examine every new bit of evidence, and every new argument. This is why we consider everything you have to say, and keep asking for evidence. The initial known version of Xiangqi has one minister in front of the general at the top of the palace and one counselor or scholar behind the general where the general is located at the start of the game in the modern version of Xiangqi. I also pointed out that Janggi has the general in the middle of the palace like in the initial version of Xiangqi which suggests that having the general or king there is the actual initial placement of the general/king. Please refer to David Li's book for the diagram for the initial look of Xiangqi. I am not endorsing the story he tells in his book. Just pointing out the diagram in the book. Take the middle column of the palace in Xiangqi, and put the counselor on the first rank, the general on the 2nd rank, and the minister on the 3rd rank. That was the original setup. That plus 5 pawns or foot soldiers in the initial positions and a chariot and horse in the corners of the board. There were no other pieces on the back rank. Therefore, out of 9 possible points on the back rank, only 5 of them were occupied. My point is that the initial version of Xiangqi which I have just described does NOT look like it is developed from Chaturanga because it has less pieces and looks less developed with the back rank unfilled. A game with its back rank filled to begin with is more developed and is probably developed at a later date, if we assume that Chaturanga and Xiangqi are related games with similar pieces on different boards. Once again, a game that has 16 pieces in it to start with is probably more modern than a game with 12 pieces that eventually became 16 a side also. In Xiangqi's development, the 2nd counselor and 2nd minister were only added after a period of time and perhaps at the time the cannons were added. In Chaturanga, or Persian Chess, or any version of 8x8 chess, all have 2 ministers/bishops to start with suggesting that they appear later in the timeline of chess. They never had more than one counselor or fers because there is only 8 spaces on the back rank of an 8x8 board. I didn't say the first 8x8 game had 2 counselors, but it did have 2 elephants/ministers in it which Xiangqi initially did not have. How do you argue that a game where the pieces need development is the earlier one and a game where the pieces do not need to be changed is a later one? The chances of that are against game design common sense. If the 1 step moving counselor and 2 step moving minister do not need to be improved in Xiangqi, that means that those pieces were designed for that board. If the original chess was from 8x8, why would anyone put those pieces there? They don't seem to fit. It's more likely that they came from another game and the game stayed that way for centuries because of tradition, but the game was not a fully developed game. You say it can be argued that a game not requiring improvement of the movement of the pieces could have been improved from a predecessor. Where is it then? They cannot find a version of Xiangqi earlier than the one I have just described, and a one step moving counselor seems pretty basic to me as well as a 2 step moving minister. Both are about as simple as pieces as I can think of. What could have preceded a 1 step diagonal moving counselor? A non-moving counselor that just sits there and cannot move? If we assume that chess pieces have always been able to move at least 1 space, there is no piece that could have preceded a 1 step moving piece. I am not saying that your argument cannot be true. I am just saying that it is unlikely that the counselor and minister had any kind of movement to it that could have been different. Only the placement of those pieces and the number of them changed over time according to the information we have about Xiangqi's development. Once again, if we assume that chess games have a common origin, the earliest known movement of the pieces would probably fit the board its been placed on. Chaturanga and Xiangqi have similar moving pieces and 2 of them fit in Xiangqi and do not fit in Chaturanga. That means that those 2 pieces suggest that they were from Xiangqi and not Chaturanga. Isn't it common sense that a civilization or person developing a game, would design movement for pieces that fit the board they are being played on? No one would do something illogical unless there was a matter of tradition involved. As in 8x8 Chess was played with a 2 space diagonal jumping bishop in Europe for several centuries until the long range bishop was finally accepted as the standard piece. Russia played with the 2 space moving bishop and the 1 space moving fers for about 2 centuries while Western Europe moved to the long range bishop and long range queen in the late 15th century. This was due to tradition that they did not want to break in Russia because chess had already been played like that for centuries. There's more than one way for the river to be added and the river to be taken out. I am not insisting it happened one way or the other. It is quite easy to look at a 9x10 intersection board with the river in it and just play within the squares. Any trader traveling between China and Persia can do that spontaneously and essentially create a different but related game. It's harder to take the 8x8 board and add the river because that would take more thinking. My argument is that there is precisely an 8x8 board of square within a 9x10 intersection board because the river has no lines going through it so if you count only squares on a 9x10 intersection board, you get 64. I am saying that in the timeline of Xiangqi within Chinese historical circles who do not look at Western sources, there is no one who believes that Xiangqi was developed during the Tang dynasty which is what the 6-8th century was in China. Although the specific timeline is not agreed upon among Chinese scholars, the Spring and Autumn period is the most agreed upon period of time that Xiangqi was originally developed. One of the reasons was because the pieces and the palace concept is from the Spring and Autumn period and the Warring States period. That is 5th-2nd century B.C. That means Xiangqi's believed timeline among Chinese historians who study Xiangqi's history or supposed history, believe the game was first developed around 700-1000 years before Tang dynasty. This conclusion was not made to counter Western arguments that all forms of chess were developed from Chaturanga in 6th century A.D. It was made internally and with no intention of starting a war of words between the East and West. I do agree that the 8x8 Chess can be linked back to 6th century India or 2nd century Persia, but there is no reason either from game design development or anything in history to suggest that Xiangqi is borrowed from a different game. What we do know is that similar games with similar moving pieces and slightly different boards popped up in India, Persia, and China by the 6th century. Which game came from which is a matter of opinion as we don't have any hard evidence of it going one way or the other. Therefore, it shouldn't be some hard fact that chess comes from India 6th century because similar games already appeared in Persia and China 400 years or more before chess is known to have appeared in India. What do you mean that my argument that games finishing their development at different points means nothing? We know when the long range bishop and long range queen were agreed upon to be in the 8x8 game. Late 15th century in Europe. This is not in dispute. The bishop was taken from the Courier in Courier Chess in Germany which comes from 13th century approximately. So what do you mean, in existence for centuries? That seems kind of generalized. I am only stating 2 accepted dates of the final development of modern 8x8 Chess in Europe and 9x10 Xiangqi in China. 8x8 Chess in Europe was late 15th century, and Xiangqi was Song dynasty in China which is about 500 years or more before late 15th century. That suggests, but does not prove that Xiangqi is an earlier game because it finished its development much earlier than Chess and did not need to change the movements of any of its pieces. In fact all Xiangqi did was add the 2 cannons and an extra counselor and minister to finish the game. That was an easier development than Chess which required more changes. Not just to the bishop and and queen, but 2 space moving pawns, en passant, and castling. Moves like castling and en passant, and 2 space moving pawns are definitely more modern concepts in Chess than anything in Xiangqi which plays very much more like an archaic game. Please be more specific when you say that the bishop and queen in their modern form had already been around for centuries. From which point? If we go back to the earliest known long range diagonal moving piece in Europe, it was in Courier Chess played on a 12x8 board which also had the 2 space moving minister in it also. All of this took place after Xiangqi was finished in its development. This suggests but does not prove that Xiangqi has an earlier start date because less work was needed to finish the game. To believe the opposite is more likely is saying that a game that takes longer in its development process and needs really special rules like en passant and castling precedes a game that did not require much change 500 years beforehand. It's not impossible, but it's unlikely. That's why I think it's silly that the Western world says with absolute authority that chess comes from India without a second thought to it and that China and Japan just copied it. That seems like a bully kind of mentality and not a commitment to actually studying what most likely happened in history. Hey, i've noticed something about this mahabharata verse, and i don't think we have been looking at it in the right context. I'll tell you why. First of all, to understand exactly what Yudhishthira is saying in this verse, you have to know what is going on in his life at this time. He and his brothers have just spent 12 years in exile and have one more year to go, but if they are detected in this final year, they must spend another 13 years in exile. So they plan to spend the final year in disguise, living in the city of Virata. So now, each brother speaks, telling the others .... 1. how they are going to disguise themselves 2. how they will spend their time in this disguise and go undetected till the year ends. With this in mind, let's look at what Yudhishthira says. Sentences 1 and 2 ... (1). Yudhishthira replied, 'Ye sons of the Kuru race, ye bulls among men, hear what I shall do on appearing before king Virata. (2). Presenting myself as a Brahmana, Kanka by name, skilled in dice and fond of play, I shall become a courtier of that high-souled king. ok, this is clear, Yudhishthira tells his brothers how he plans to disguise himself as a pro-gamer, so to speak. Now sentences 3 and 4. (3). And moving upon boards beautiful pieces made of ivory, of blue and yellow and red and white hue, by throws of black and red dice. (4). I shall entertain the king with his courtiers and friends. Now the 3rd sentence here is the one we are always told Yudhisthira describes a game, however, this is not true, Yudhisthira is actually describing HIMSELF PLAYING A GAME. He is telling his brothers how he will be passing his days in the king's court playing games. It is one thing to describe a game, but it is another thing to describe yourself playing a game, they are two different things. And look at the 4th sentence, it follows on from the 3rd, it shows the outcome of his playing games, he shall entertain the king. In the 5th and 6th sentences, Yudhisthira then says how he will be undetected. (5) And while I shall continue to thus delight the king, nobody will succeed in discovering me. (6) And should the monarch ask me, I shall say, 'Formerly I was the bosom friend of Yudhishthira.' And look at the last sentence .... (7) I tell you that it is thus that I shall pass my days (in the city of Virata). He finishes telling them 'it is thus that i shall pass my days ..'. When you understand he is describing himself playing a game, rather than the game itself, it isn't such a big deal he has used the word 'board' instead of a more specific term. How many of us today use the word 'board' instead of 'chessboard', and as far as not describing the piece movements, what is the point? If we ask these questions, 'why not board specific word' and 'why not describe piece movements', i think we are clearly not understanding what Yudhisthira is telling his brothers. If you read the Mahabharata after Yudhisthira finishes, all his other brothers speak, telling how they will disguise themselves and how they pass their days in this disguise. Also, looking at the 3rd sentence of Yudhisthira, note his words 'And moving upon boards' and 'by throws of black and red dice'. He is painting a picture of himself playing the game. You will note in this sentence, he describes what the pieces are made of, the colors of the pieces, even the color of the dice, all the visuals. Also i think it is interesting he says 'beautiful pieces', though you can conclude nothing from it. It is more easily imaginable this describes chess-like pieces rather than Pachisi pieces, though as i said, this proves nothing. Oh, one more thing, i think there is also no doubt Yudhisthira's brothers knew very well the game he was talking about playing. So i think i have to go back to what i originally thought, this game could be a pachisi type game or it could be chaturaji. yeah it does seem strange after a pretty detailed description of the game no info on pieces is given. Pachisi doesn't sit too well either does it, because of the dice maybe? i looked on wiki about that game and it says it is played with 'shell' thingies for dice, and you use 6 or 7 of them to roll or each roll? i'm guessing though you could play with dice? hey john you don't have an exact quote from murray about this verse do you? i'll post soon what i have concluded about this verse too, there's a couple of questions i have also about it. Murray argued, and I agree, that if the chessboard had been meant, the text would name the ashtapada, rather than using the general term phalaka (gameboard). One of the most engaging facts about chess in any form is the variety of shapes and characters and names of the various pieces, and in a colorful description of the game--'of blue and yellow and red and white hue, by throws of black and red dice'--the author would, I think, have mentioned the variety of pieces, if there had been any variety, instead of using a single word that is not specific to chess at all. I agree that it is possible to apply this description to chaturaji. I think it is a very bad fit. Jason compares two games as they currently are, and acknowledges that both are somewhat modified. Just how much each is modified relative to the 'original' is of course begging the question, but he rightly points out that Xiang Qi is far closer to its pre-Cannon precursor than FIDE Chess is to Shatranj and Chaturanga. It does not follow that pre-Cannon Xiang Qi is itself closer to the common ancestor of all these games. Jason could be saying that as change has been slower in China recently, it has always been slower, but that is ultimately just a guess. It could equally be argued that we would expect the average change has been the same both east and west of India, in which case the mere addition of Cannons to Xiang Qi is a change to a game that had alreday been drastically changed - from being on an 8x8 board, perhaps. This too is just a guess, but one pointing to an Indian rather a Chinese 'original'. My instinct is still to credit India, simply because it is so much easier to imagine an 8x8 board in two halves turned into a 9x10 board with a River than vice versa. EDITORIAL NOTE: Jason, I have excised a small part of your otherwise well-written discussion. What I have done is remove opinions on a non-chess topic. I understand people have strong opinions on many topics, but we get heated up enough about chess here, and site rules specifically state non-chess topics may be removed. I will do so when I feel it is in the best interests of the site. Should you or anyone wish an explanation of my decisions, please contact me at the email address listed on my person ID page. Joe Joyce, editor, TCVP ****************************************** I believe that Xiangqi originates from China, but I did not come here to say that the Persian and Indian versions are definitely copied from it. It's assumed in Western chess origin discussions, that Chess originates from India and that Far East Asian countries like China, Korea, and Japan all copied it. That's the assumption I am pointing out here as being a superiority thing. The truth is that Westerners play Western chess on an 8x8 board. Therefore, most would rather believe that the original game was the 8x8 game and not some 9x10 intersection game played in dirty Chinatowns all over the world. It's the same thing with Chinese people. They would rather believe that their game came first. Gives them a sense of pride. I talk to a lot of Chinese people about this, and they definitely prefer to believe their game is an original design. In more objective analyses on chess origin, documentation seems to support India, archeology seems to support Persian, and game design seems to support China. The game design aspects I have been repeating like a broken record because no one is acknowledging the really common sense things I am pointing out, support a Chinese theory but do not prove a Chinese origin. The British controlled all of India and Hong Kong is just a small part of China. India was Britain's crown colony. So it's not the same situation. The whole Xiangqi vs. Western Chess debate also extends into which game is more complex and well designed. I have met many Westerners who immediately bash Xiangqi as being a more simple game where the pieces don't move as far as the bishop and queen. Xiangqi also has an incompetent horse that can't even jump. Well, the average number of moves to finish a Chess game is around 40 and Xiangqi is around 47. The game tree complexity of Xiangqi is also about 20% higher, but these facts are not considered of course. It's because of the no-perptual check rule in Xiangqi that the game tree complexity is 20% higher which artificially inflates the complexity! Not because of the larger board of course. I don't know that much about archeology and documentation and what is considered legitimate, but I do have common sense, and anyone who plays these 2 games will feel that the Western chess game is more modern and evolved. That means newer! When teaching Xiangqi to Westerners over here, they feel that Xiangqi feels more archaic because the pieces are more limited. That implies that the game is older, and not newer. I am talking about the game design aspect of course. If 2 games are obviously related, the one with pieces that feels more archaic is probably the older game. If you look at Courier Chess (the German 12x8 game) it is obviously older than the modern version of the 8x8 game because of the limited movement of many of the pieces. Without knowing the history of Courier Chess and 8x8 Modern Chess, one can tell that Courier Chess is older. Why don't these common sense things apply to Xiangqi as well? Forgive me for repeating a broken record, but it is fairly well recognized that the best version of the 8x8 game was not finalized until the late 1400's when the modern queen and bishop were both used at the same time, and the final version of Xiangqi came about in the Song Dynasty which is about 500 years earlier. Based on this game development timeline of the 2 games, which game most likely came first? A game that finished its development 500 years after another one or the one that finished its development 500 years before? This is not rock solid proof, but it certainly suggests that the commonly accepted India origin may be suspect based on a game design point of view. So does anyone want to discuss the origin issue from a game design standpoint, or are you guys going to attack me personally for suggesting that this is a racist issue? Let's take the minister/bishop/elephant piece for example. There was a great deal of experimentation with this piece for around 1,000 years. There was the Silver General move, which exists in Shogi and Thai Chess, there was the 2 space diagonal jump move, and also a 2 space orthogonal jump for this piece. That means that between India, Persia, and Europe, it seems that we didn't know quite what to do with this piece before settling on the long range bishop. Now, the Xiangqi minister or elephant if you will, has always had that same exact movement which is 2 spaces diagonal and in the final modern version, the 2 ministers are placed on the same diagonal so they support each other. In Xiangqi history, the starting position and number of ministers changed, but not the movement as far as I know. So from a game design standpoint, if we assume the minister in Xiangqi and bishop in 8x8 chess have a common origin, which game was it originally designed for? A game where it did not undergo any change (movement wise) in its entire history, or a game where there were at least 3 different versions of it and didn't get fully developed until like almost 1,000 years later in Europe. The jumping bishop couldn't even capture its counterpart because the 2 pieces will end up jumping over each other. That doesn't sound like good game design to me. That seems like the piece was not designed for that board, so the movement of the piece needed to be changed. It needed to evolve into a piece that could move 1 or more spaces, so that bishops on the same diagonal could capture each other and not always jump over each other. One more thing about elephants. Please keep in mind that Xiangqi pieces originally did not have color, so the pieces were written with different Han Chinese characters to distinguish them. Xiang (Prime Minister) rhymes with Xiang (elephant), and the minister piece is supposed to simulate what a high level gov't. official does in his own countryside. It stays near home and doesn't go across the river to the other side. Who would design an elephant piece that was mostly defensive? War elephants are not defensive in real warfare. So the elephant debate does not apply to Xiangqi. Does anyone want to talk about game design and the evolution of pieces on different boards? I'm not here to try to present documentation of a Chinese source that Xiangqi 'does not' come from India. Such documentation does not exist probably, because no Chinese documentation would feel the need to say such a thing literally because they probably never considered the possibility. Just because Murray writes a big book on the Indian origin theory, doesn't mean I need to provide a Chinese source that says it's not the case that China copied India. I'm just looking at the bigger picture from another point of view. As I pointed out in an earlier post, the Chinese in general do not say that the West copied chess from them, but just feel Xiangqi is their own game. But the reverse is not true. The common notion in the West is that Xiangqi comes from India as do all forms of chess. I'm not even saying that India and Persia copied China. I'm just saying that Xiangqi seems to be older for a lot of common sense reasons. Jason, you say that chariots were not used in Chinese warfare beginning with the Chin Dynasty, about twenty-two centuries ago, and that this suggests that chess in China is older than that. Interestingly, chariots seem to have been disused in Indian warfare since the invasion by Alexander of Macedon and his mixed army twenty-three centuries ago, and some have used that fact to argue that chess in India dates from before Alexander. 'Anyway, Li's book presents all the Western arguments which are always based on the indisputable assumption that India is first or else the white man loses face...' It seems to me that the British might have felt (not that I can discuss this with any nineteenth-century British) that they would lose face if they had chess from their own Indian subjects. I get the impression that they thought China more civilized and respectable than India. As for Dr. Li's assertion that chess survived underground at the Imperial Court for eight hundred years, this is as completely unsupported as everything else he says about chess before the Tang Dynasty. The two supposed chess pieces from Russia from the second century are actually from Uzbekistan (Dalverzin Tepe). They are an elephant and a bull, so they are not generally accepted as chess pieces. The earliest generally accepted chess pieces are also from Uzbekistan (Afrasiab, right by Samarkand), from the eighth (Christian) century. There are seven of them, covering all six ranks. As for the Chinese naval expeditions of exploration some six centuries ago, I accept that they happened; they left archeological evidence here and there. We wicked westerners didn't destroy the records, the Chinese did. I have already stated that the Chinese originated gunpowder, rockets, and printing with movable type, and we have them from China. By the way, I have a Chihuahua. According to sources including the Wikipedia, archeology has found remains of dogs of this type, but larger, in Mexico in the centuries before the Spanish Conquest. Our small Chihuahuas are supposed to be derived from the pre-Conquest dogs crossed with Chinese miniatures brought by the Conquistadors. I asked for any evidence that the Conquistadors, or for that matter the Spanish of that period, had Chinese miniature dogs. Profound silence. I suggested that the Chinese miniature dogs had more likely been brought by the Chinese in the generations before the Spanish Conquest. Continued profound silence. Jason, the rest of us have disclaimed any investment in whether chess originated in China, India, Iran, Bactria, or Antarctica. You are the only one--the only one!--who has suggested that pinning down the location where chess originated would say anything about the superiority of one nation over another. Jason, You're sounding like a broken record. You keep repeating the same insubstantial and fallacious arguments. If the Chinese historical record shows that Xiangqi is not of Indian origin, show us this. Don't complain that westerners will not read Chinese sources when you cannot even produce one single Chinese source to back up what you're saying. Peter Banaschak has carefully looked into the Chinese sources on Xiangqi, as described in this article on his website, and he has not found adequate evidence that Xiangqi is earlier than Chaturanga. Also, let me reiterate that the white man has no stake in whether the brown man or the yellow man created the original version of Chess. It is true that India was part of the British Empire. But so was Hong Kong. If it is at all prestigious for the British for them to think that Chess comes from India, it would be just as prestigious for them to think that it came from China, which Hong Kong is a part of. And if the British were really so motivated by racism to dishonestly claim an Indian origin for Chess, why didn't they just claim a European origin or a British origin for Chess? You keep trying to frame this as a racial issue, but it is not one. And where did you pick up the idea that Americans believe all good things come from Europe, or by extension regions of the British Empire? It's ridiculous. I'm an American, and I've never met any other American who has claimed such a thing. Charles, if you were replying to me, 'ashtapada' is not only the name of a race game, it is (primarily) the name of the 8x8 board on which it was played, and on which chaturanga was also played. Ashtapada is not at all chesslike, but neither is Wei Qi. Whichever was the original version of Chess was a big change from anything that went before. I do have David Li's book, which I bought years ago. I had read a favorable review of it that led me to expect that he had interesting new evidence on the origin of chess, but I was disappointed to find that the book merely piled up a tower of unsupported speculations. The closest thing to evidence was an anecdotal account of Xiang-Qi's being invented by a figure from ancient Chinese history, who as I recall lived a few centuries before Christ, the anecdote being attributed to a Chinese document only a few centuries old. This is valueless as evidence of such a theory: it means only that someone about the time of Newton or Voltaire wrote down a legend about something that had happened about the time of Alexander the Great. Without earlier documents, how could the late author know anything about events so far in his own past? Maybe the 18th century Chinese author got the story from an earlier period, but there were plenty of earlier periods between the supposed events and our document when such a legend could have been composed. Besides this legend, everything I could find in Li's book was a seemingly endless parade of descriptions of how it MIGHT HAVE happened that way, and how it's really not so implausible that it COULD HAVE happened that way. Well, of course, it MIGHT have, as I didn't need Li's book to know. But that's what we call 'idle speculation', not evidence. Someone needs to find some much older documents, or dig up some very old equipment, or something, or this theory will remain negligible. Hey, H.G., i came across this webpage the other day, i'd like to know if you have ever seen this and what you think. http://infomotions.com/etexts/gutenberg/dirs/1/5/4/7/15475/15475.htm The Mahabharata of Krishna-Dwaipayana Vyasa, Volume 2 Books 4, 5, 6 and 7 / Optic, Oliver, 1822-1897 the intersting part is where Yudhishthira says ... Yudhishthira replied, 'Ye sons of the Kuru race, ye bulls among men, hear what I shall do on appearing before king Virata. Presenting myself as a Brahmana, Kanka by name, skilled in dice and fond of play, I shall become a courtier of that high-souled king. And moving upon chess-boards beautiful pawns made of ivory, of blue and yellow and red and white hue, by throws of black and red dice. Okay, first I don't own a copy of David Li's book. So I can't follow your references to it. Since you keep invoking Occam's Razor, I will point out that it favors my theory, not yours. To account for why other regional Chess variants are more like Shatranj, your theory supposes that they are descended from a descendant of the original game that lost its similarities to Weiqi. My theory is simpler than this, and it goes like this. (1) Shatranj, Malay Chess, Thai Chess, Burmese Chess, and Xiang Qi all share a common ancestor. (2) This common ancestor was played on an 8x8 board with 16 pieces per side, these being 8 Pawns, 1 King, 1 Counselor, 2 Elephants, 2 Horses, and 2 Chariots. (3) This game was probably invented in southwest Asia, spreading to China and southeast Asia through trade routes. (4) In China, someone familiar with Weiqi modified the game to take on a very different form, whereas in southeast Asia, the game stayed closer to its original form. (5) Since Korea is in northeast Asia, and its only neighbor by land is China, it got only the Chinese version instead of the original. (6) Japan, relying more on sea travel due to being an island nation, may have picked up versions from southeast Asia, as well as Korea. The Korean influence on Shogi is seen mainly in the name, which is identical when written with Chinese characters. Let me add that we are not arguing about whose culture is superior. When it comes to India vs. China, both cultures are renowned, and it matters little which is the birthplace of Chess. Even if India is the birthplace of Chess, China still has much in its favor. It is the birthplace of Go, and more importantly, its culture has been much more egalitarian than India's. Indian culture has been dominated by the caste system of Hinduism, whereas China accepted Buddhism, a reform of Hinduism that rejected the caste system, and its promotion of Confucianism led to an egalitarian society in which education mattered more than birth. On a personal note, I am neither Chinese nor Indian, but I'm close to some Chinese people, and I don't currently have any Indian friends. So, if anything, I have a slight preference in favor of China being the birthplace of Chess. For me, this is about facts and evidence, and what I know tends to favor the Indian origin of Chess. What I've read of David Li's theory hasn't convinced me. Yes, you make good points about how other variants in Asia are closer to the Shatranj game, but that does not make me think that that was the original game because of the thought historical chronology of the game suggested by Dr. Li. As the book points out, early on the 9x10 intersection board was not accepted by the Persians and the 8x8 board played in the squares was also developed by the Chinese as an experiment. This version was accepted by other cultures and that is why other countries which are quite close to China like Thailand are close to Shatranj. Shogi seems to be a mix of Xiangqi and Shatranj so its possible it was influenced by both and over a long period of time. The pawns in that game move forward and capture the same way which suggests influence from Xiangqi, but many other aspects of that game are either Japanese developments or influence from Shatranj. So while I think your point is true that most chess variations in the world are closer to Shatranj with Korean chess being the exception, coming from my Chinese point of view, it doesn't really matter because 1st century B.C. which is at least 400 years after Weiqi is invented seems more reasonable to me and I am not stuck on intersection points or squares because they are basically the same thing. The logical points brought forth in Dr. Li's book is enough for me and I look forward to one day looking at supposedly supporting evidence either in Chinese literature or artifacts being found in China that support the existence of Xiangqi as we know it today. If this debate didn't exist between China and the West, Chinese scholars would say Xiangqi started around 1 B.C. or around the beginning of the Han dynasty. They did not make that time period up just to be 800 years before the start of Chaturanga in India. The Chinese did not proclaim their game as the first one, but just think it's their own game from around that time. It was the West that proclaimed that Chaturanga was first and that automatically all other forms of chess are derived from it without looking into other sources from other countries. It seems that the Chinese are confident of their own history while the West has to make proclamations about other cultures in order to boost the superiority of their own culture. If you look at some of the quotes from the British writers, they want to equate all inventions that Chinese believe they had to the Indians. It's not about Chess. It's about putting down China because the Brits seemed to hate them for the last 300-400 years. Or rather, China wasn't a British colony so its history needed to be ignored. I'm sure the Dr. Li book won't have much of an influence on anyone who is so sure of the Chaturanga theory that is known as fact in the Western world. Even if several artifacts dated well before 600 A.D. were found throughout Asia, it wouldn't budge a single Westerner's assumption that Chaturanga was the origin of all chess games out there. Playing chess within squares is more popular throughout all the world's chess variants. Does that make it the original game or could that just be the version that was exported out of China that was accepted by other cultures? Regarding the diagrams on the supposed evolution of Xiangqi in Li's book, the original version did not have any ministers but just one adjutant. If Chaturanga is the original game and the Chinese copied it from India, that means they took out 2 ministers/bishops and 3 pawns and rearranged them on the 4th rank so they'd be split. That seems unlikely that a culture would delete pieces it borrowed. In the Chinese chronology, 1 minister was added later, and then later on there was 2 ministers and 2 adjutants as well as 2 cannon. But obviously, the game had already been transplanted to other parts of Asia and the Middle East where the cannon was not included. I gave most of my reasons in the last post so this one will be a bit shorter. We need to look at sources from all over the world and their possible dates to make solid conclusions about chess origins. However, I don't see a single shred of influence in Xiangqi from any other game from its original form to its modern form 1,000 years later. And I can say that because the first version of Chaturanga looks like a late version of Xiangqi without the cannon pieces. The original version of Xiangqi had a very open board. Only 11 pieces for each side. 5 foot soldiers, 2 chariots, 2 horseman, 1 adjutant placed behind the general, and the general on the 2nd rank by himself. Now assuming that a chess game starting from scratch would have less pieces and not more, which game looks like it is the more likely predecessor assuming they really are related cousins? A game like Chaturanga with 16 pieces on it with the back row filled up and the soldiers/pawns fully filled, or a fairly empty board with only 5 pieces on the back row and a lone general on the 2nd row. Which board looks like an earlier development? If you have the book, its illustration 20 on page 173. If I were designing a chess game, I would start with the basics and then add more later on to spice up the game. Since all variants of Chess were being experimented on by various cultures throughout the world as things were adjusted and added on, the earliest game would most likely be the one with the least number of pieces on its original board which is 22 for Xiangqi as opposed to 32 for Chaturanga which has 2 ministers/bishops in it that did not exist in Xiangqi at first. If one assumes Xiangqi is taken from Chaturanga, that means the Chinese deleted pieces and then put them back at some later point in the Tang dynasty. That doesn't seem very logical. If pieces get deleted, that means they don't work right, but the Chinese supposedly deleted pieces and then put them back if you follow the Indian chess origin theory. On the other hand, most board games start with less and then later developments generally add more to the game and fix up some rules to make it run smoother. So I hate to repeat that old adage Occam's Razor, but the more I look at diagrams in that Li book of early Xiangqi boards, the more brian-twisting I need to do in order to find some kind of logical justification for things being the other way around. The West always compares the original Chaturanga board to the modern version of Xiangqi and sees how similar they are in terms of pieces and movement, so that's all the proof that is needed without considering if the converse could be true. Then the Chinese look into their own records and produce boards with less pieces which look more like an early version of Chess, but the West hasn't looked at those early designs and has tried to reverse engineer history in its own way by only looking at the modern version of Chinese Chess. A Chinese person (not me) really needs to bring all the relevant and credible documents towards so-called early designs of Xiangqi to the world so the rest of us don't have to get into these discussions over whose culture is superior or whatever. Unfortunately, the Chinese have a habit of destroying each other's things because they are always fighting amongst themselves given that they think there is nothing else worth fighting for except what we know as China today. > within the squares or on intersection points. In fact this is exactly how I use the board in my multi-cultural min Chess set. Just slip in the River between the two board halves when playing Xianhqi. If we look at the cultural transmission of religion, we see that the transmission goes from India to China, not in the reverse direction. Buddhism spread from India to China, Japan, and Korea. Taoism and Confucianism, which began around the same time as Buddhism, did not migrate to India. If this is due to a general direction of cultural transmission, it adds to the likelihood that Xiangqi is of Indian origin rather than Chaturanga of Chinese origin. I can't believe no one until now has noticed that 2 boards are just the same thing with the river removed and the pieces being played within the squares or on intersection points. I can't believe it either, mainly because I know it to be false. This has been noticed before. For example, I pointed it out in my How to Play Xiangqi (Chinese Chess) video, posted to Youtube on October 13, 2010. On December 21, 2008, I made the same observation in this comment, which addresses the same topic as you've been addressing here but takes the Chaturanga-first position. Have you guys looked at this site suggesting Egypt as an earlier place where 'chess' like games have been played? http://www.wordiq.com/definition/Timeline_of_chess http://www.wordiq.com/definition/Origin_of_chess I'm not insistent that Xiangqi is the first board game that has 'chess' merits in the world myself, but am mostly annoyed that there is a Western claim that the early Indian version is the first and only one and that all others must have come from it when the reverse could easily be true. I don't know the details about literary references in Chinese potentially meaning different games and that was not my point about the gameplay between Xiangqi and Chaturanga. I was saying that the pieces move in a very similar fashion but they happen to fit the Xiangqi board naturally as if that kind of movement was designed for a 9x10 board with a palace for the king. I think that is a very common sense observation of the counselor and elephant. They fit in that game and they protect the king. Moving 1 space for the counselor and 2 spaces for the elephant is all that is needed to protect the king, but in the 8x8 board, the queen moving 1 space and the elephant moving 2 spaces don't really seem to do anything defensively or offensively, suggesting that those moves were not designed for that board and set up. i.e. possibly taken from a different game. Meanwhile, in most of the Western analysis of the game play differences, the observation that there are stark similarities are there, but its assumed that China copied India and therefore copied the West once again because India is a part of the British empire. Of course those words are not spoken directly, but the author's bias is clear. If there were other board games representing war developed all over the ancient world, then our discussion gets even more complicated, but I feel that the Chaturanga vs. Xiangqi argument is really just head butting between Western Europe and China. That's why in the Li book you see the authors making very strange statements like Chess pieces become better or more liberated moving West, but become more constrained when moving East. That's not the only explanation and its not necessarily even logical from a cultural standpoint. I can't believe no one until now has noticed that 2 boards are just the same thing with the river removed and the pieces being played within the squares or on intersection points. But anyone is entitled to their own opinion as far as which game influenced the other. But I do think that reasons given by Western writers for how it could have gone from India to China, don't seem logical to me from any standpoint and that they never thought about it happening the other way around which does in fact make sense to me from the standpoint that the original game would have pieces that move better on its board. Is that assumption too much to make? If you were developing a game, you would make the pieces move with a sense of purpose. As for what the Courier Game may have contributed, on the comments page for that game H.-G. Muller suggests that, in addition to the modern bishop, the Courier Game may have given us the optional double first move of the pawn. In the Courier Game the queen's pawn and the two rooks' pawns on each side (and the queen) must each make a double step forward at the start of the game. Now, when the optional double first move of the pawn was introduced, it was limited to the king's, queen's, and rooks' pawns. It was then extended to the bishops' pawns, and lastly to the knights' pawns. The 3 commenters are not mentioning yet 96 squares and 100 squares in pre-modern chesses. John Ayer's revised genealogical timeline changes Courierspiel(96) as contributing to Modern Chess of 64 squares, rather than traditional thought of its being dead-end branch. Is that only for the Bishop? Then more importantly and maybe radically, Ayer's article posits I think something like 8 -> 10 -> 8 in the very early going, with Shatranj al-Kamil v.1 being the large size 100 10x10. I think that anytime we say that one thing came from another, the converse also needs to be considered because there is usually another line of thinking the person has not considered just like I would have never have thought anyone would think that Xiangqi could have come from Chauturanga because the pieces in that game just don't move right. Shatranj is just a better version of that game, but I am mostly looking at things from a common sense standpoint. I don't know anything about how games in different places influencing each other or any of that because it doesn't appear there is any definite way of confirming that in history, but it's just logical to me that Xiangqi developed after Weiqi in China and that the Chinese are strong in boardgames. To say that Xiangqi developed Tang dynasty which is quite late in history seems like this was stated just to be after the 6th century 'invention' in India. From a Chinese point of view, if Weiqi developed 5xx B.C. or much earlier, it is not much of a stretch to think Xiangqi developed a few hundred years later. Also, both games are played on intersection points and have similar tactics with blocking pieces in so they can't flee. It's easy for a Chinese person to believe that Xiangqi (without the cannon) was developed around the Qin/Han dynasty. The pieces, the cultural aspects, and the tactics seem to be from that period. Whether we are overseas Chinese growing up in N. America or in Asia somewhere, the Qin and Han dynasty period are very clear to us as far as what was going on in China and what kind of warfare was used. Xiangqi shows a civil war between 2 Chinese armies. Since Qin and Han dynasty was all about civil war, we would think the game developed around that time or a little after to represent what was going on at that time. We would not think that just because several British/European thinkers proclaimed that India was the origin in the 7th century or so and we wanted to be some 800 years earlier to be superior. We would think that Qiangqi was from Han/Qin, independently of what the Western world would think. So to us, its not even a debate. We are not proclaiming that the Indian/Persian versions were influenced by Xiangqi for sure, we just think Xiangqi came from around that period of civil war. If one says it was developed in the Tang dynasty, we would think it was strange because the Tang dynasty was well organized and expansive. The Tang dynasty was invading other regions of Asia and was not a period of civil war. Or at least, that's what our impression of that period is. It's the golden age of expansion and not Chinese fighting amongst Chinese as it always is. I know I gave a lot of reasons why I think the Indian version was developed from Xiangqi, but my main point is that among a very large population of Chinese people, if you were to ask them when Xiangqi most likely developed whether it was an original invention or borrowed from India like Buddhism, they would not say Tang dynasty. They would think Qin/Han dynasty. Problem is, the Indian version only traces back to the 7th century, so there's a discrepancy of 800 years or so implying that it might be the other way around if the 2 are related. I feel like this argument was really started by the West and Chinese people are getting sensitive about it because we don't appreciate Westerners assuming everything originated from there and nothing Chinese is really Chinese. That may be true of nuclear and stealth technology, or a great deal of technology developed from the 17th century and afterwards, but China was technologically advanced up until the end of the Ming dynasty, so we wouldn't automatically assume anything worth a grain of salt must have come from the West before that period. Plus, in regards to the issue at hand, China happens to be strong in board games while India is strong in divinity and Chinese people acknowledge that. I haven't read through all of Li's book, but I think this issue is worth delving further into on my own. Of course, even if I found some kind of historical document that appears to be dated like several hundred years before 600 A.D., that seems to be referring to something like Xiangqi, I am sure that it would be automatically refuted by the West because the exact word 'Chess' wasn't written there. Of course, it wouldn't be. Chess is an English word, and Chinese would just write 'qi', which means chess or a board game of some sort, but that requires a translation into English and it isn't a precise translation. It seems that because there isn't a precise word in Chinese that means 'Chess' therefore, no document or historical etc., can be counted as evidence because its a matter of semantics. If anything, the summary of logic from the Western writers shows a definite bias towards Indian documentation and not anywhere else. If we want to say Int'l. or Western Chess is clearly derived from these earlier Indian versions, that is fine with me, but it isn't necessary to automatically proclaim that other forms of chess in other parts of the world are all derived from that same version also. I feel this debate that has been going on for centuries or whatever isn't even totally necessary. Why can't we just look at how chess was developed in different parts of the world instead of proclaiming that any one version was the mother of them all? That's like making comments on another country's history and culture and making judgments for the sake of making a world claim on a board game in another country as being the true one and all others are modified from it. We should just leave Chinese history to the people who can read the language and study it. There's no reason to tell another group of people that they are 'incorrect' about their own estimations to when their board game was developed. If the Chinese don't make assertions about Indian history or any other country or region's history, then why can't the same be done for the Chinese or Han region too? Murray was aware of the Ramayana. It contains references to the ashtapada, which we know antedated the game of chaturanga, and to the chaturanga, in the sense of an army of four branches; none to the game of chaturanga. Murray does not mention the Arthashastra as far as I see. I find on line a commentary by Group Captain S. M. Hali on the military portion of this work, in which, I gather, 'chaturanga' means an army of four branches. If the Arthashastra really does mention chaturanga as a war game on an eight-by-eight-square board, I would very much like to see the text. I have read Prof. Li's book. In fact, I own it, and have taken it off the shelf and am looking through it again. I am still not persuaded. As I have explained elsewhere, I don't think Chinese chess developed from chaturanga, I think it developed from Shatranj al-Kamil v.1. While the king (governor, general)'s and aide-de-camp's moves were restricted, because they landed in the nine-castle, the dabbabah's move was greatly increased, and the pawn's move was slightly increased, and simplified. I can't imagine how that weird rule about the pawn capturing diagonally forward would ever have been introduced after the game had been established. I understand that there were elephants in China, too. There are different kinds of symmetry. FIDE chess has reflective symmetry: symmetry with respect to a line, as I think of it. The crossover pattern has rotational symmetry: symmetry with respect to a point, as I think of it. I don't recall about the names of the armies. That could be suggestive. I live in America, and it is no matter to me whether chess originated in India, China, Bactria, Iran, or Albania. I am simply trying to make the best sense I can of fragmentary evidence. Jason L. asks, 'But what if there are historical documents or artifacts in China that suggest that Xiangqi has been around since 2nd century B.C.? What if the similarities between the early Indian version and Xiangqi were the result of influence from the other way around? Are there any such documents? Last fall someone argued in the English Wikipedia that Chinese chess is the earliest and original version, but the only substantial source offered was a Chinese document at http://ent.veryeast.cn/ent/26/2006-4/23/0642309574393496.htm . Can you translate this for us? Prof. David Li stated that Xiangqi was invented about 200 B.C., but in the first section of his book, in which he described this invention, he adduced not a single source of any type. 'Just because European scholars had no access to Chinese documents but did with Indian archives, that does not mean it can be assumed that the first game was from India. It seems since China was not a part of the British empire, then its archives can be ignored and only regions of the world which are a part of Britain's sphere of influence can be deemed as inventing anything.' Britain was heavily involved in China in the nineteenth century, and quite influential, and British savants could probably have gotten access to Chinese documents. We are aware that China invented many things, including gunpowder and rockets. 'How come no Westerner or scientist has noticed the similarities between Weiqi and Xiangqi?' I don't know about Weiqi, but Gerhard Josten, of the Initiative Group Koenigstein, argued in his essay 'Chess--A Living Fossil' that the ancient Chinese pastime of Liubo was one of the ingredients that went into chaturanga. 'Also if one assumes it went from India to China, it is unlikely that pieces would become more restricted. This is a misnomer.' A misnomer is an inaccurate name. Probably 'This is a fallacy' was meant. 'So when the Chinese come forward with so called records, they are refuted by European chess historians as being inaccurate!' What records? At Goddesschess John Ayer rejects also the received genealogy, http://www.goddesschess.com/chessays/johnayer.html. Http://www.goddesschess.com/chessays/chessaystoc.html, afore index of many historical chess articles. ___________And another specific one of those from their Goddesschess history index: http://www.goddesschess.com/chessays/needham1.html. ________________The Silk Road: http://www.goddesschess.com/chessays/remus.html. It's widely assumed by Western scholars that Indian chess was the first form of chess, but it is also widely assumed that Asian forms of chess were derived from it although there is no direct evidence of it other than the fact that the pieces move in a similar fashion. But what if there are historical documents or artifacts in China that suggest that Xiangqi has been around since 2nd century B.C.? What if the similarities between the early Indian version and Xiangqi were the result of influence from the other way around? Just because European scholars had no access to Chinese documents but did with Indian archives, that does not mean it can be assumed that the first game was from India. It seems since China was not a part of the British empire, then its archives can be ignored and only regions of the world which are a part of Britain's sphere of influence can be deemed as inventing anything. I have not done the research myself, but it is generally considered by chess historians with access to Chinese archives that Xiangqi came much earlier than the Indian version, so no scholar who can read Chinese would think that the Indian version came first. This does not prove that the Indian version came from China, but the similarities in the boards would suggest that one is taken from the other but with a different board. The 8x8 chess board used for the India/Western version is simply the 9x10 board for Xiangqi with the river removed. This removes a row, and results in an 8x8 board if you play in the squares and not on the intersection points. Therefore, in a way, the 2 boards are almost the same board. What can be objectively pointed out is that the pieces for Xiangqi move in a way that fit its board that has survived up to its modern form while the moves for the counselor/Queen and elephant/bishop do not fit the gameplay of the 8x8 board. That's why the pieces were logically improved or adapted to fit the gameplay of an 8x8 board later on. 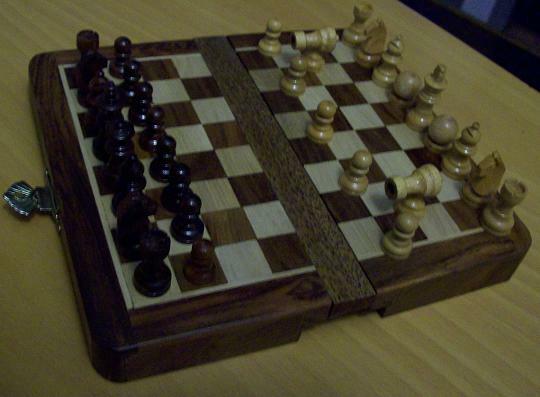 If we assume that one game influenced the other and was the first version of it known to man, then it is more reasonable to assume things went from China to India based on the fact that the 9x10 board actually fits that movement and the 8x8 board does not suggesting the initial movement of those pieces was borrowed and does not fit the 8x8 board. Also if one assumes it went from India to China, it is unlikely that pieces would become more restricted. This is a misnomer. The main reason why the pieces can jump over pieces in the Indian version is because the board is smaller and the pawns are right in front of the horse/knight and elephant/bishop requiring the rules to be adapted so they could move right away rather being blocked right off the bat. Western researchers conclude that pieces become more restricted when going East and more free when moving West. But does that really make any logical sense? Are our cultures so different that Asians like to restrict, and Indians, Persians, and Europeans like to make things more free? That makes it sound like Westerners or countries colonized and/or influenced by the West like to make things better while the people in the Far East like to make things 'worse'. It's more reasonable just to look at the different boards and notice that a major difference between the 9x10 board and 8x8 board (other than the size difference) is that the pawns are not blocking the main pieces in the 9x10 board so the pieces can move right away. The fact that the knight and elephant can be blocked in Xiangqi is reminiscent of Weiqi where the 2 sides are 'blocking' each other from going to further territory albeit with stones rather than pieces. How come no Westerner or scientist has noticed the similarities between Weiqi and Xiangqi? Also, let's not forget the bigger picture in terms of board games in China. If Weiqi was first recorded in the 4th century B.C. and now there are claims that Xiangqi was first played in 2nd century B.C. and has similarities in the blocking concept, why is that so hard to believe for Western Chess historians? Because it has already been stated and stressed in European literature that Chaturanga was the first game, so why would an entire continent of people want to revise their thinking and basically admit that they did not consider an entire region's documents simply because that would be tantamount to admitting either ignorance or basically a condescending attitude towards 'yellow people' who could not have possibly invented anything first. So 2nd century B.C. is not that much of a stretch for board games in China. Actually, the origin of chess in China makes a lot more sense because the cannon was not added until much later when that kind of technology was invented, so that's a more probable reason why the cannon has no corresponding piece in Indian/Western chess. A version without the cannon was brought over earlier before it was recorded in India first. And its the version with the cannon that seems to have been brought over to Korea and Japan. i.e. It went to those regions later on. Why does the origin of those games have to be from India also when they resemble the modern Chinese game more than the original Indian game? It goes back to the original assumption that not enough Western writers/scientists or whatever you want to call a person with a right to have an authority on this subject, said that India was first and that is the end of the conversation. One would think that if there was a different version of Go that is widely played in Europe and India, Western scholars would also insist the origin was India by only looking at Indian documents that support their thesis without bothering to look at any records in Chinese. So when the Chinese come forward with so called records, they are refuted by European chess historians as being inaccurate! So Europeans also know Chinese history better than Chinese people. Well, that is something I had not thought could happen. Or is it just Western arrogance as we have all become accustomed to in this world? In no way, am I attacking this website or anyone in particular. I am just frustrated with why even things that can be viewed objectively, are not being viewed objectively like the awkward movement of certain pieces in the Indian version and fluid movements of those same pieces in Xiangqi. That is an objective observation anyone could make but instead other theories that do not seem reasonable are put forward without the converse ever being considered. If the question is which chess game was first and therefore could have been the father of all others, then shouldn't archives and other related evidence from all over the world be considered before declaring any one country or region as the first game? This page describes chturanga rules as if somewhere was official documents, that states that 'in 7th century chess was played for 100% sure in this way...' and describes these rules. I think, page must state that exact rules of first form of chess are unknown and mentoin some alternative rules, wich also could be in the first chess. Maybe, it's ok that it did'nt mentoided other possible rules of promotion, stalemate, bare king, king's special knight's leap, but it's horrible that it did'nt mentoided another possible elephant's move: silver general's move, 1 square diagonally or 1 forward (elephant's 4 legs and trunk)!! All other souces tells that no one knows, wich move came first! And the earliest game with silver general, described on CV pages is makruk, as if this move was invented in Thailand! While CV pages is probbably one of main source for these, who want to know more about history of rules of chess (most of encyclopedias don't mentoin anything further than 'first form of chess was played by four players and with dice')! I like the depth of the article. It is a short article to be sure. I like the subject of chess. I like the game of chess. what exactly is the difference from shatranj? The version of the Indian game we play and call 'National' to distinguish it from 'International' (meaning FIDE) is as follows: 1. King moves as usual, except for any number of possible knight moves before it was checked once. No castling move, the knight move can be used to take the king to safety. 2. Queen (Mantri/Minister), Bishop (Gaj/Elephant), Knight (Ghora/Horse), and Rook (Nouka/Boat) - all move as usual in the FIDE rules, but there is no castling move. 3. Pawns move just one square. (Naturally then, no en passant.) 4. Each sides are allowed two moves to begin the game. I'm Celine Roos WIM. It was just luck that I found a page through Google search for Books which linked to a French translation of an 1805 report established by a Research Society on Bengalese studies. I guess the English original must be available somewhere. If I had more time, I would propose a translation into English but I'm terribly busy these days, having left the world of chess for the world of National Education in France. On 2005-04-04 Fergus Duniho wrote: 'I've removed Chaturanga from the list of recognized variants, because it has recently come to light that we don't know enough about Chaturanga to actually recognize it. The best candidate for the rules of Chaturanga is Shatranj, which remains on this list.' <p>I agree with Christine Bagley-Jones and Tony Quintanilla that Chaturanga should stay on the list of recognized variants (FAMOUS section). After all, both Dragonchess (E. Gary Gygax) and Tridimensional Chess (Star Trek) were famous before complete and consistent rules were published. you guys have made this site better than professionals ever could, because you do it out of love for chess, not love for money. surely this is the best chess/chessvariants site in the world. I'm thinking it shouldn't be. Given that we don't know what its actual rules were, it's a bit hard, if not impossible, for us to recognize it. And if it is the same as Shatranj, which is the most likely candidate we have for the rules of Chaturanga, then recognition of Shatranj will suffice. I think the one with the Elephants in the corners, etc., was another game, not Chaturanga. We don't have the rules for Chaturanga. So whatever game you chose to call Chaturanga might well not be Chaturanga, and you might not be able to do any better than to have Chaturanga support in name only. I plan to get rid of the Chaturanga Game Courier preset, because I have no guarantee that is is authentic Chaturanga, and for all I know, Chaturanga was the same as Shatranj, which I already have available. But if you wanted to keep this game, you could call it something like Gollon's Chaturanga to distinguish it from the real thing. Thanks, John. I gather from your comments that Gollon based his description of Chaturanga on descriptions of three other Indian variants, none of which were Chaturanga. Would it be fair to say that Murray identified Chaturanga with Shatranj and didn't make any distinctions between their rules? This is what Pritchard does. He gives only a short entry on Chaturanga, saying that it is 'essentially the same as SHATRANJ', and then he gives detailed rules only under his entry for Shatranj. Also, back when I lived in Rochester and had access to Murray's books, I wrote in my Alfil article, 'Chaturanga was an Indian Contempory of Shatranj, and it is Shatranj, the Muslim form of Chess, that we actually have the earliest documentation for.' Some sites I've found on the web are claiming that there is no physical evidence for the existence of Chaturanga. It would seem that Shatranj is the earliest Chess variant for which we actually have historic documentation of its rules, and Chaturanga is a hypothetical construct that is presumed to be the ancestor of Shatranj, but for which we have no clear historical record. In the absence of a legitimate historical record, it may be fair to assume that the rules of Shatranj are the closest thing we have to any account of the rules for Chaturanga, and for all practical purposes, it would make sense to play Chaturanga by the same rules as Shatranj, or to just play Shatranj and consign the rules of Chaturanga to the unknown. '... a move that inflicts stalemate must be retracted, and another move played.' - Sounds reasonable. Apparently only SHOGI has a forfeit rule for illegal moves. 'The game begins with each player moving his counsellor and counsellor's pawn two squares forward...' Compare the mandatory opening moves in Courier Chess. As for the 'the color restrictions of the elephant, now moving as a bishop' - that must be a modern rule. Alfils can be regarded as moving on an 8-color board, forever limited to either the odd-numbered ranks or the even-numbered ranks. See Leaping/Missing Bat Chess for some diagrams. Thanks for reporting what Gollon says, Jared. My last comment got posted before I saw the update to your post. Your comments partially answered the questions I raised, namely by narrowing down the possibilities to #3 and #4. Would you know if Gollon has specified which is correct? Also, I still have concerns about whether Gollon has accurately reported on what Murray wrote. Murray wrote a large scholarly text whose focus is more on history than on clearly laying out the rules to specific games, and I expect Gollon used Murray as his primary source. So if anyone has access to what Murray wrote, reporting on it will still be very helpful. I've thought of one more question concerning the rules stated on this page. Assuming that the Pawn promotion rules here stated are correct, they aren't fully specified. Can a Pawn move to the last rank even when there is nothing for it to promote to? If so, does it wait around until there is a piece for it to promote to? If not, can it still check a King when it can't move to the last rank? This gives four possibilities. 1) The Pawn can advance even when it can't promote, and it just remains on the last rank unable to ever do anything more. 2) The Pawn can advance even when it can't promote, and when an available piece is captured, it promotes to it. 3) The Pawn can neither advance nor check when there is nothing for it to promote to. 4) The Pawn can't advance when there is nothing to promote to, but it can still check. Does anyone know if Murray or Gollon addresses this issue? Or does this rule only come from a more recent Indian variant, making the matter moot concerning Chaturanga? In The Encyclopedia of Chess Variants, Pritchard mentions this rule in connection with more recent Indian variants under his INDIAN C entry, but he does not mention it under his CHATURANGA and SHATRANJ entries. Could Gollon have confused what Murray wrote about Chaturanga with what he wrote about more recent Indian variants and so have misreported its rules? I have a copy of Gollon's book. I can check this out later today. EDIT: Checked it. The book I'm using is Gollon's Chess Variants Ancient, Regional, and Modern, first edition. According to this book, the starting position and stalemate rules are correct. However, the promotion rule listed here is inaccurate. First of all, pawns do not promote to the piece which started on the promotion space, but to the 'master piece' of that file. In other words, the piece of yours that started in that file is the one that determines promotion, not the one of the opposing army. This only has ramifications in the central two files. Gollon's rules also require the actual piece that started in the file to which the pawn will be moving to have been lost, not just a piece of the type. (The example given is that a pawn cannot promote in the C file until his elephant which started in the C file has been lost.) Additionally, according to Gollon, a pawn may not even move to the last rank unless it is able to promote, which is not stated here. Since I don't presently have access to the books by Murray or Gollon, I can't check on the accuracy of what this page says, but I am suspicious of some details. Other accounts I've found of Chaturanga say that it is essentially the same game we know as Shatranj. For example, Pritchard says this, and so does Cazaux. Yet the rules given here differ in some respects. In Shatranj, Kings face Kings and Councellors face Councellors in the opening position, Pawns promote only to Councellors, and the player who stalemates his opponent wins. Since I'm planning to write a rule enforcing Game Courier preset for use in the tournament soon, I'm hoping someone with access to Gollon or Murray would check up on these details and report back whether this page accurately states the initial position, the Pawn promotion rules, and the rule that delivering stalemate is a loss. I just re-read the rules, and a pawn reaching the King's square simply stays there (it doesn't promote.) I guess I just missed that when I read the rules the first time. Sorry! I played Chaturanga with a friend a few days ago, and it's really slow-moving. It's also very hard to get a checkmate on your opponent especially if you don't have a Rook. I don't like the elephants the way they are, but the pawn promotion rule is interesting (I like it better than the promotion rule in orthodox chess). But the stalemate rule is weird. To me, stalemate should be a victory for the player who immobilizes his opponent, not a loss. After all, that's what a real war probably would be like.